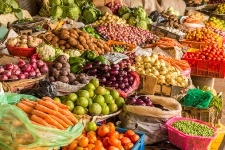 Patients with chronic kidney disease can shield their kidneys from further trouble by upping the amount of fruits and vegetables in their diets. This will protect against too much acid buildup. Here’s the problem: the typical U.S. diet is based on meat and grain products. These are highly acidic and can lead to “metabolic acidosis,” defined by high acid levels in the body. This is especially common among kidney disease patients, as that organ is responsible for removing acid through the urine. The condition can lead to rapid breathing, confusion, and lethargy. To combat this, doctors use alkali supplements, but researchers say that simply eating more fruits and vegetables (which naturally have alkali) will also help. ALSO: More on kidney disease and nutrition. • Both groups had similar kidney function. • Both groups had reduced metabolic acidosis and, in fact, it seemed that consuming more produce helped reduce metabolic acidosis more than the conventional treatment. • Both groups had strengthened kidneys, discovered via urine measurements. • Although fruits and vegetables are rich in potassium, levels of this mineral did not rise in either group (which can be dangerous to kidney patients). Thus, the study proved that shopping in the produce aisle will help kidney patients maintain kidney health. People who may have a harder time following a diet high in fruits and vegetables can use nutritional supplements on the side. This will be effective as well. This is a big area of kidney disease research, and it further illustrates the power of simple nutrition. Goraya, N., et al., “A Comparison of Treating Metabolic Acidosis in CKD Stage 4 Hypertensive Kidney Disease with Fruits and Vegetables or Sodium Bicarbonate,” Clinical Journal of the American Society of Nephrology 2013; 10.2215/CJN.02430312.